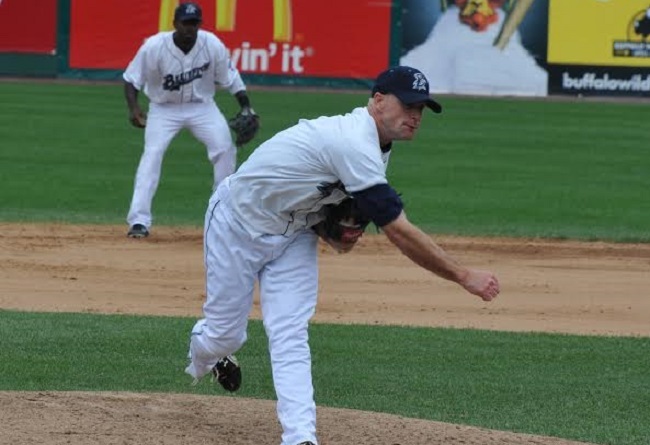 When Logan Kensing took the mound in Bridgeport back in 2011 he already owned 134 major league appearances, but he was coming off two bone-spur operations. Now 33, the reliever was able to only get one more game in The Show (Colorado, 2013) until Sunday. Seattle called Kensing up about midnight Saturday after he had pitched for Triple-A Tacoma in Colorado Springs that night, and if all goes well he will get to tack on more outings in the Mariners bullpen where he is now the third--and last--right-hander. A good sense of humor always serves a well-traveled baseball player well, and Kensing proved he has one after the first batter he faced in his Seattle debut, the Chicago White Sox's Adam LaRoche, bombed a weak sinker for a two-run homer that cut the Mariners' lead to one run. "I swear he looks into your soul when you're standing on the mound," Kensing told The Tacoma News Tribune after the game. "But I was actually thinking I had a better beard than he did at the time. But he won today, and hopefully I'll get to face him again." The former Bluefish (he had a 1.64 ERA in nine outings in the Atlantic League) should be cut some slack for giving up the LaRoche homer. He flew into Sea-Tac Airport with his Tacoma mates about 25 minutes before the American League game started, hopped in a car, arrived in the second inning and was in the game in the sixth. Kensing struck out Alexei Ramirez to end the inning, got the first two hitters in the seventh, then walked a batter and was replaced. "(Getting back to the majors is) why we all play the game, and that's why some of us just keep playing," the former Florida and Washington hurler told The News Tribune. "There's other jobs out there, you can do other stuff, but at the end of the day, you know your window of opportunity is always shrinking every day even if you're good, so you just give it everything you've got until you can't go anymore." Kensing signed in May to play in Tacoma and was 2-0 with a save and a 2.33 ERA in 19 appearances when he was called up to Seattle. Previously the chief spokesman for Commissioners Bowie Kuhn and Peter Ueberroth, Bob Wirz has been writing extensively about the Atlantic League and Independent Baseball since 2003. He is a frequent contributor to this site as well as writing his blog, www.IndyBaseballChatter.com.